Provide comfort for the family of Mary Ockay with a meaningful gesture of sympathy. Mary E Ockay passed away on April 13, 2019 at Meadow Lakes in East Windsor at the age of 95. Mary was born on March 10, 1924 in Bayonne, NJ. Our mother Mary will always be remembered for her sweet disposition, her sunny smile and her beautiful blue eyes. She will also be known for her adept sewing ability. Whether it was helping a neighborhood seamstress resolve a botched alteration, or sewing beautiful dresses for her daughters. Not appreciated at the time, was our mother’s great enthusiasm for creating matching outfits, or the durability of those garments that resulted in a series of hand-me-downs for the younger daughters. She sometimes made special occasion dresses for herself, and would make a matching tie from the same material for her husband, Andy. Later in life when we were grown, she started making doll clothes for a doll collection. In the last few years, Mama Mary focused on making highly sought-after teddy bears, some of which she sold, but most were given away or donated to charity. At times, she could hardly keep up with the demand. 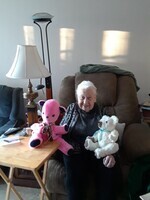 Commonly seen hand sewing her bears around Meadow Lakes where she became known as the "Bear Lady." Mary grew up in Linden, NJ where she spent her childhood and school years. She spent most of her married and family life in Roselle Park, NJ where she raised her five children. She was a member of St Joseph parish in Roselle, NJ and was an active member of the Mother's Club and Rosary Society organizations. Mary was predeceased by her parents Anthony and Leokadia Szymanski and her brother Joseph. Mary was also predeceased by her beloved husband of 65 years Andy (Andrew) and their cherished daughter Joan. Mary is survived by her three brothers Frank Szymanski, Walter (Inez) Szymanski and Leonard Szymanski, and by her four children Elaine (Gerard) Ulias, Barbara Ockay, Clement (Dina) Ockay and Marion (Rob) Kallok. Mary is also survived by her cherished grandsons Bobby and Richie Kallok. The Ockay family would like to thank the staff and members of the community of Meadow Lakes for making our mother's eight years at Meadow Lakes so enjoyable and enriching. In lieu of sending flowers, we ask that you perform a random act of kindness. And when you see a teddy bear think of her. To send flowers in memory of Mary E Ockay, please visit our Heartfelt Sympathies Store.